The Chicago Bears will play their all-important third preseason game on Sunday afternoon when they take on the Tennessee Titans in Nashville, but a few notable players were left behind as the team travelled south. Offensive lineman Kyle Long, who is dealing with an ankle issue and is recovering from offseason surgery, will miss his third straight preseason game as he continues to rehab the injury. 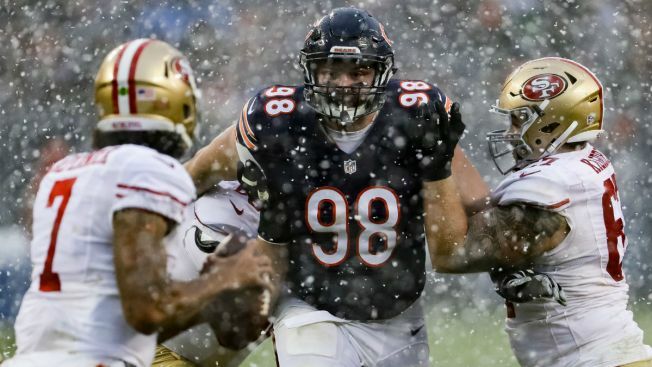 A pair of defensive linemen that figure prominently in the Bears’ plans this season will also miss the game, as Jonathan Bullard and Mitch Unrein will both sit out. Bullard, a 2016 draft pick of the Bears, is nursing a thigh injury, and Unrein, who is looking to be an impact player off the edge, is dealing with a concussion. The Bears did get some great news on the injury front, as Danny Trevathan was able to travel with the team and could play against the Titans. Trevathan figures to be a critical component in the middle of the Bears’ defense, and getting him back on the field at this stage is a big addition to a front seven that has been largely impressive in the first two preseason games. The Bears will take on the Titans beginning at noon in a game that will air on Fox this Sunday. Quarterback Mike Glennon is expected to play the entire first half, and Mitchell Trubisky will get at least one series with the first-string offense in the second half of the game.